Bollywood has lately been churning out biopics by the dozen. Most demonstrate a proclivity for melodramatic excess. But not so Poorna. 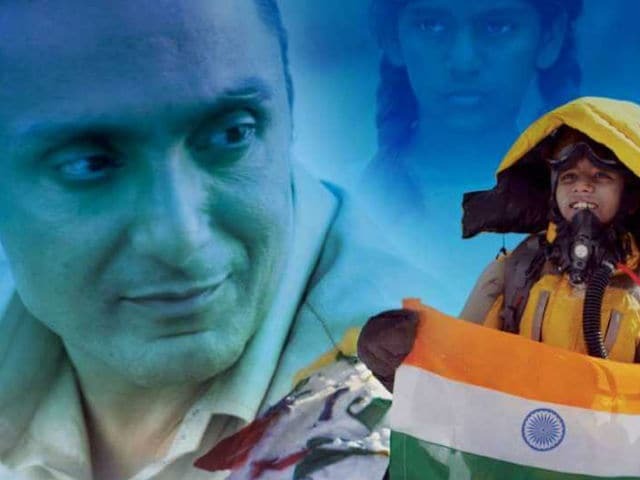 In bringing to the screen the remarkable true story of the youngest girl in history to conquer Mount Everest, director Rahul Bose, helming a film after a 15-year hiatus, settles for an understated mode. The muted methods he deploys enhance this sensitively crafted female-centric, triumph-against-all-odds cinematic account. But let's get this out of the way at the very outset: Poorna doesn't mark the apogee of sports-themed filmmaking. It's no heart-pounding cliffhanger. It is a welcome addition all right to the genre, but it never soars to the kind of rarefied heights that are scaled by the plucky Adivasi girl whose inspirational exploits the film celebrates. But Poorna still works well enough - both as soulful cinema and simple, straightforward storytelling. The screenplay by Prashant Pandey and Shreya Dev Verma, steadfastly true to the purpose of the film, abjures distracting detours. The actor-director who was once the poster boy of India's English-language cinema chooses to err on the side of restraint rather than go overboard to mine the high-drama potential of the protagonist's improbable journey from a hot, dusty, nondescript Telangana village to the world's highest mountain peak. Poorna is a rare Hindi film that travels to the heart of rural landscape. Even rarer is the use of a smattering of Telugu in the dialogues, which, along with an effective musical score, augments the authenticity of the film's setting and soundscape. It also draws enormous strength from the deeply affecting performances by newcomer Aditi Inamdar (in the role of the resolute Poorna) and Bose himself (as the unwavering mentor firm in his belief that it is his responsibility as a bureaucrat to facilitate positive change in the lives of the most disadvantaged). Bose significantly expands the scope of the narrative by touching upon some of the larger social issues that swirl around the lives of marginalized communities that struggle to survive in the face of widespread official and societal apathy. But, inexplicably, he does not explicitly spotlight the identities of Poorna and the fellow mountaineer (Dalit boy Sadhanapalli Anand Kumar) who followed the girl to the Everest summit in May 2014. Their twin triumph is made doubly far-reaching on account of who they are in the context of India's caste dynamics. In achieving the unimaginable, Poorna has to surmount more than just the physical challenges posed by the Everest expedition. She has to dodge the prospect of an early marriage and the risk of her dreams being cruelly crushed. But, equally, as an Adivasi and the daughter of poor farm hands, she is in danger of being condemned to an endless cycle of poverty and deprivation. So, she has to fight on many fronts, in the mind and with the iniquitous world around her, armed only with her innate grit and determination. The film glosses over much of this. A dispiritingly cynical bureaucracy, inevitably, gets the rough end of the stick. This aspect of the tale, represented by sketchy characters played by Dhritiman Chatterji and Heeba Shah, is the weakest link of Poorna. These officials, thrown in to embody the face of an insensitive system, are merely peripheral to the story of Poorna and only serve to hinder its flow. Nothing in the world could have been further from Poorna's village in the flatlands of Telangana. Not even a speck on the map, it is a place where girls stand little chance of breaking free and charting their own course. That is where the drama stems from. The heroine of Poorna dares to reach for the sky. She travels from Pakala village to a community school that gives her the chance to try her hand at rock-climbing in Bhongir before she is ready to head to the Himalayan Mountaineering Institute in Darjeeling. Poorna lives in a climate of overwhelming hopelessness - a fact brought out with striking efficacy in the 'poverty game' that has Poorna and her schoolmates throwing light on their dire circumstances with all the innocence of childhood. But thanks to a couple of strong allies in her climbing coach Sekhar Babu (Gyanendra Tripathi) and IPS officer R.S. Praveen Kumar (Rahul Bose), she gets a well-deserved shot at altering her life for the better. She grabs the opportunity with all her might. Aditi Inamdar is perfectly cast, as is S. Mariya as Poorna's spunky cousin Priya, who eggs the heroine on to change her fate. Aditi and Mariya are such naturals that they do not need to 'act' to convey their emotions. The delightful little shenanigans that the two girls indulge in until the real world catches up with them give the audience a reason to forge an instant connect with them. It lasts all the way to the end of the film. Aditi's scenes with Bose, too, come off rather well. Segments of the audience might however be left feeling a tad shortchanged by the limited focus on the eventual expedition that catapulted Poorna Malavath into mountaineering history. But Poorna is a large-hearted film: more a heartfelt portrait of courage than just another routine underdog film. Small gripes shouldn't offset its overall impact. It is considerable.